– The dictionary of Aromatherapy. Homeopathy is a therapeutic. This is an alternative method of care that is based on two fundamental principles: the law of similarity and the infinitesimal. It is also a way of thinking that brings us closer to nature. Phytotherapy: as its name suggests, it is a treatment (therapy) in plants (phyto). You will discover a traditional approach based on the use of plants as virtues discovered empirically. But also a more contemporary approach, based on advanced scientific evidence seeking active extracts of plants. These extracts are standardized assets identified. These are herbal. Aromatherapy is the use of extracts of certain plants, known as essential oils (or ET) to harmonize the physical and mental health. They are also beneficial to promote self-healing. 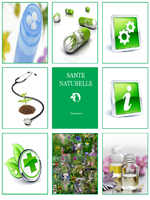 Natural Health HD is a dictionary application to reference a set of practical information and related public Homeopathy, Phytotherapy and Aromatherapy. Natural Health HD provides an introduction to the terms of Homeopathy, of Phytotherapy and Aromatherapy. It did not aim to treat you or give you a prescription but simply to expand your knowledge base on these topics. Usability full functionality and use on a tablet. Fast in handling and use. – Quickly create bookmarks with reading personal note taking. – Fast, comprehensive search, from words but also character (Case sensitive). – Keeping your previous search. – Liaison with the Mail application, sending the contents of the dictionary by email. – Presentation of 405 illustrated images of plants and substances addressed. – The images of plant and substances used are those proposed licensed site Wiki Media Commons. – Buttons to decrease and increase the font size for reading. – Customization for screen display Retina display. – Instant access to the online application and offline. – Use in portrait or landscape mode if necessary to obtain approval for further reading. – Custom use (display mode, font size, setting a default email address, display the alphabetical index to access records). – Sending the info dictionary by email. – Possibility to create your own « favorites ». 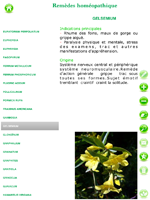 – Main properties of the plant, description, dosage cons-indications, constituting dosage. 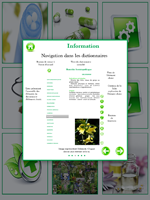 – Information, property plant or essential oil, indications, precautions.